First International Bank have sponsored 2 Villages with ZonLights& ZonHomes in the Foni District of The Gambia. However what makes their intervention more remarkable is their offer to also provide door-step bankng services to all villages recepient of the Initiative. FIB Bank have offered to depute their Bank Manager from the Kanilai branch to each of the villages ( 7 in number so far), provide them with a safe deposit box and and account in the branch. The manager will not only bank their collections, but also provide them with an interest on their deposit. 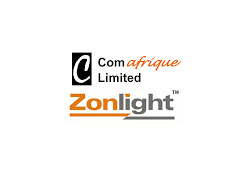 This gesture, seemingly small, transforms the impact of the ComAfrique InteliZon initiative into one that major development organisations have been attempting to do for years. The principle is simple - yet its results are far reaching - like Neil Armstrongs first steps onto the moon - a small step for man..but a giant leap for mankind. Getting villagers organised to organise their own light needs is a small step and thier being able to bank their income is a giant leap. Though the villagers do say that the provision of light sustainable with a 1 Dalasi ( 0.04US$) payment by itself is a giant leap.